There’s probably not much lamer in a blog than writing about a two-year-old book (and if there is, I’ll find it, you just wait) but after reading what I felt was a catty and vicious attack on Safran Foer by a leading vegan website, I wanted to defend him (like he needs me to come to his defense). What makes this attack even more pathetic is that the attacker openly — and proudly — admits to never having read the book. But that doesn’t keep this ethicist from posting a photo of Safran Foer with a photoshopped pus mustache (pustache?) under the headline “got pus?” (Though to the attacker’s credit, a “got milk” reference is pretty original and cool.) What angers this critic is that Safran Foer is a vegetarian not a vegan, and the critic knows this because he’s read some reviews. In fact, the reviews are apparently enough to tell this critic all he needs to know about the book. Well, I apologize for talking about a book that I actually did read, I know that’s so 20th century, but it seems pretty clear that this critic is simply jealous of Foer, and of the fact that this vegetarian has done far more to turn people vegan and alleviate animal suffering than this webmaster ever will. Yeah, I thought it was odd too that Safran Foer hasn’t actually come out and declared that based on what he now knows, he’s become vegan, but he does say that if you really want to do something to alleviate animal cruelty it’s better to give up eggs and dairy because those are the worst-treated animals. So it’s not like he’s saying that drinking milk is just swell. Safran Foer also says he spent over a year researching this book. Keep in mind, he’s one of the country’s young literary stars, and he interrupted his fiction career to do this. That shows some dedication. And he also talks about how he snuck into a factory farm at night and broke into a building housing chickens. Has the critic ever done that? I won’t presume to know, since that would be presumptuous. Can’t the argument be made that it’s more beneficial to animals to convince people to become vegan or vegetarian, than to spend your time bitching about people who convince people to become vegan or vegetarian? This critic needs to have a couple of stiff ones at his next Vegan Drinks event and then sit in the corner thinking about who’s done more to help animals. Maybe then he’ll take down that catty photo and feel at least a little embarrassed about having put it up in the first place. Good for you for defending Foer! Whether he “needs” it or not, I think it’s lovely to see someone sticking up for him. He is a lovely author (one of my favorites) but even that is beside the point. I’ve been vegan for about five months now, and I think the most surprising thing that I’ve found is that vegans can be quite vicious. And to fellow vegans or to vegetarians most of all! If more people took time to consider the situation before they criticized, perhaps vegans wouldn’t get such a bad rap. So I commend you! Keep up the good work, and the critical thinking! There were very few published rebuttals to Michael Pollan’s (vegan bashing) diatribe “The Omnivores Dilemma”. (I mention this because Foer’s book seems a direct challenge to Pollan’s ideas). In fact, only three efforts of any note (that I’m aware of), were at all critical of Pollan. “Hard to Swallow” by B. R. MYERS, http://www.theatlantic.com/magazine/archive/2007/09/hard-to-swallow/6123/, in which the criticism is primarily aimed at exposing the excesses of this seeming snooty food movement. The second being the book “The Way We Eat: Why Our Food Choices Matter” by Peter Singer and Jim Mason. In it, these two scholars hammer out a convincing case for veganism by pointing out Pollan’s often illogical conclusions. (This is by the way, a “must read” for vegans who wish to counter many of the absurdities of the locavore’s claims making). 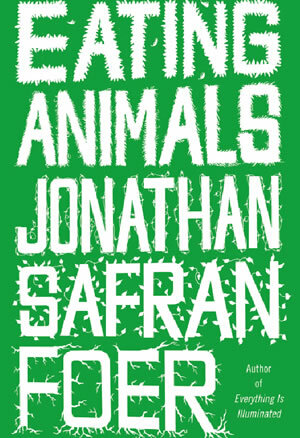 And of course, Jonathan Safran Foer’s “Eating Animals”, which you correctly credit with mainstreaming veganism more than any other author, except possibly Peter Singer. I have little doubt that life for vegans would have been much, much more difficult, had Foer’s powerful counter-weight not been written. While others within the movement have contributed some great works on the subject of food, (and its future), none has had the public stature required to offset the press that Pollan was garnering. So, when our world is finally in a uproar over who is, and who isn’t more vegan, on that day, I’ll write bitter, scathing criticisms of Foer. Richard, I just wrote something about “The Omnivore’s Dilemma” on the blog. I recently bought the Peter Singer/Jim Mason book you mention and I plan to read it soon. Thanks for your comment.